Valentine’s Day is just days away ya’all! What are you doing to express love for your loved one? My husband and I will celebrate 38 year of marriage in June of this year, and part of the “glue” that has kept us together is our mutual love of food – cooking together, conversation around the table, even working together on a photo shoot for the blog. He’s the first to say he’s a “lucky man” when he sits down to enjoy Grilled Lamb Chops with Spinach Roman Style, Seared Scallop with Mushroom Risotto, or Mexican Grilled Sea Bass with Avocado Crema and Mango Salsa (a few of our Valentine’s Day special recipes). I always try to include a fancy dessert too (something he rarely gets to enjoy). Like many of you, he loves his sweets. Mark Andersen is not the only sweets lover I know, so a few of my favorite food blogger friends put together a virtual #galentinesday party. ALL. PRETTY. SWEET. TREATS. Hubby will think he’s died and gone to heaven! I highly recommend you check out each and every one of these picture perfect creations, and pick one or five to prepare for your special someone… You’ll find their links at the bottom of the post! So, back to my Blood Orange Margarita Sorbet! I seriously have an obsession with blood oranges since moving to the Rio Grande Valley. (Have you noticed?) They’re available for a few months every year, and after being scarce to non-existent in New Mexico, I find myself dreaming of new ways to incorporate them into my recipes – both sweet and savory. My fascination with them is due, in large part, to their gorgeous color. I was a designer in my previous life, and color continues to drive many of my food preferences as well. Blood oranges are not just a more intense color than other oranges, though. They actually have a distinct flavor as well – less acidic than their “regular” cousins, a tad bitter, sweeter, with a hint of raspberry. I have made blood orange margaritas, and I figured the beautiful color would make a really pretty and festive Valentine’s Day sorbet. I was thrilled with the results before I even put it in my ice cream freezer. 😀 Stunning? The process for making this sorbet is a simple one: Use a peeler or paring knife to remove the zest from 1 blood orange and 1 lime. Add it to the sugar and water to make the simple syrup. Squeeze the citrus, then run it through a fine mesh sieve (to remove the pulp). Add the completely cooled and strained simple syrup to a bowl with the citrus juices, the blood orange zest, the tequila, and sea salt (don’t argue with me on this please 😮 ). Stir to combine, then chill before adding to your ice cream freezer. Serve immediately (it will be softer) or freeze for later (it will be a little hard but still scoopable). I typically don’t have problem with the scoopability of my sorbet recipes, and I have made quite a few! However, this was my first citrus based sorbet, and they’re a bit trickier. The juice has no real body to it, unlike my Mulled Red Wine and Plum Sorbet, my Blushing Apricot Sorbet with Fresh Thai Basil, my Raspberry Double Chocolate Sorbet with Stout. 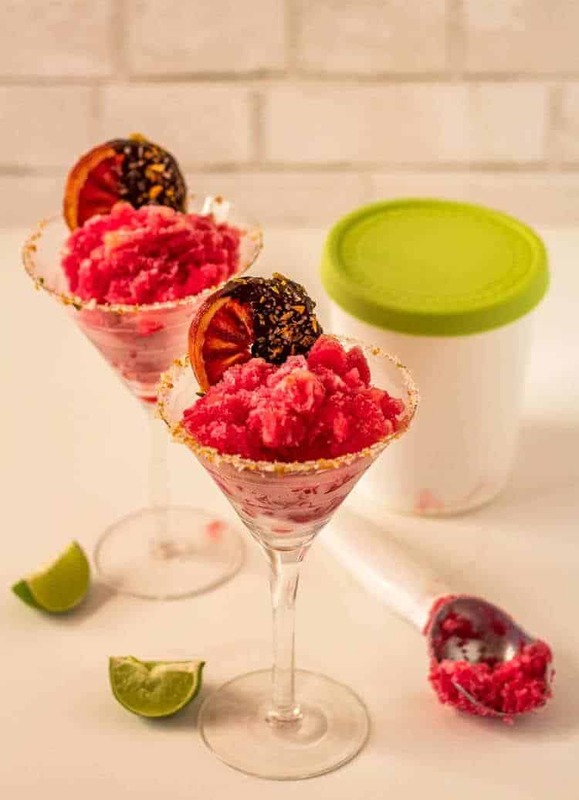 The Blood Orange Margarita Sorbet was quite scoopable out of the ice cream freezer, but really hardened overnight in the freezer, making it difficult to scoop for photos. However, the flavor is fantastic. For more on the science of making sorbets, see The Science of the Best Sorbet. The vermillion hue of fresh-squeezed blood oranges combined with fresh lime juice, tequila, and citrus simple syrup makes a gorgeous and refreshing not-too-sweet finale to a beautiful meal! In a small saucepan, bring sugar, water, and citrus zest strips to a boil; simmer until the sugar is dissolved, (about 3 minutes). Remove from the heat and let cool completely. Use a citrus zester on 1 of the blood oranges (you have already removed the zest from 1 orange and 1 lime for the simple syrup but in strips). Use a zester or microplane as you want fine bits. Set the zest aside. Squeeze all the citrus into a bowl, then run through a fine mesh sieve to remove the pulp. Rinse the bowl, and add the strained juice, the reserved citrus zest, the strained simple syrup, tequila, and fine sea salt. Add a few dashes of orange bitters if using. Stir well. Freeze the chilled sorbet mixture according to your appliance manufacturer's instructions. Scoop into pretty bowls or glasses rimmed with sea salt. Garnish with a chocolate dipped candied orange slice, or if you prefer, and square of dark chocolate. We get an Intense Orange Chocolate bar that is perfect! Obviously this sorbet takes more than 20 minutes. It takes about 20 minutes of active time. You can shorten the "chill" step by sticking it in the freezer, but don't allow it to freeze. The "freeze" time varies by appliance. You don't have to use a "top shelf" (expensive) tequila, but don't reach for the bottom shelf either. Use a decent quality silver tequila (you don't want the color from gold). 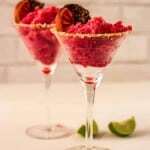 I have garnished the Blood Orange Margarita Sorbet with my Chocolate Dipped Candied Blood Oranges. Feel free to omit or garnish with dark chocolate... The salt does add to the margarita flavor of this recipe, and I love it with my Citrus Sea Salt. Calories include the sorbet only, not any additional garnishes. I'm envious of the lucky Valentine that gets served these. Not only are they just beautiful, but everything about them sounds wonderful! Love that little garnish of the chocolate candied orange and so clever with the salt rim. Thanks MJ! Hubby thinks he's pretty lucky ;-) I do admit to loving a little salt with my sweet! This sounds so amazing. I'm quite tempted to make some right now! Thank you! Thanks Julie! You ought to give the sorbet a try! OMG wow!! These look so good and I love the garnishes - yum! My pleasure Kendall! I obviously am not a vegan blogger (or even vegetarian); rather, most of my recipes are "healthy with global flair" (with a few exceptions!). However, some important people in my life have dietary restrictions, and my sister is eating vegan and gluten free in an attempt to improve her health issues. So I do try to occasionally post a recipe that works for her too :-) In this case, vegan was the intent! Wow! 38 years! Now that is some true love right there. And speaking of love. . .I am absolutely enamored with the sultry color of this frozen beauty. It's absolute perfection. True love stands the test of time! I can't say that road has always been easy, but it has been fulfilling... Thank you Lynn! The sorbet is pretty special, but so simple. I wish I had the patience to make one of your beauties! I can't think of a better treat to celebrate Galentine's Day with. A margarita sorbet is exactly what the doctor ordered! Too bad we can't all get together and share our treats! Happy Galentine's Day Meg! I'm impressed with 38 years of marriage! Blood oranges are my favorite fruit - so refreshing and cool, too. Good for our 80 degree day in LA. Citrus and California go so well together! You'll have to give it a try... blood oranges are definitely one of my favorites as well (as evidenced in the number of recipes I have that feature them)! As much as I love dairy, I try to cut back...sigh, haha!...an this looks like an awesome dairy-free option. :-) Thank goodness for sorbet, especially if there is booze in it! Ha! 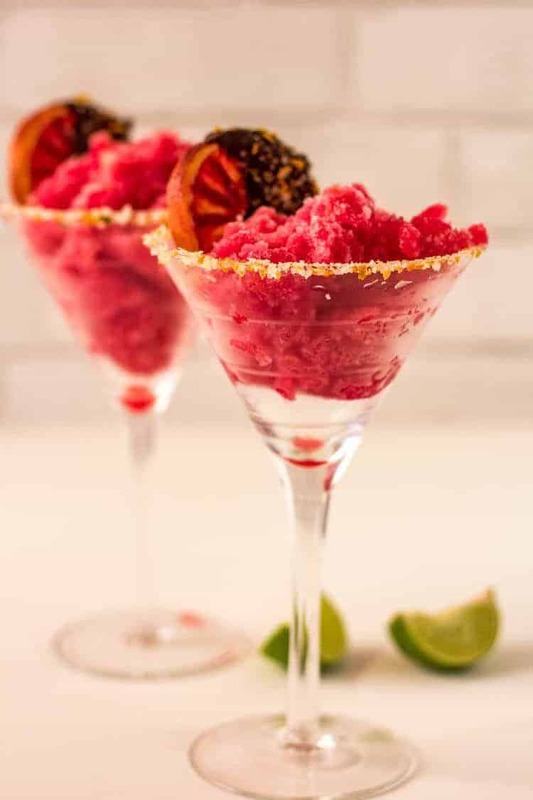 Aren't frozen desserts always better with a little booze? Lol. What an awesome recipe for all those beautiful blood oranges Tamara! Perfect for Galentine's Day! The sorbet is so simple, but it really does show off the feature ingredient! I love anything with blood orange and this has me sporting my heart eyes! So fresh and delicious!! And oh yeah - FUN! ;) Happy Galentine's Day, my friend! Thank you Annie! Happy Valentine's and Galentine's Day to you! This is just incredibly good! I love blood oranges, and the hint of tequila flavor really adds to it. It really does hint of margarita doesn't it? Oh you had me at the chocolate dipped orange. I love the colors too and the citrus combo for the drink. It will be perfect for us here in Cali all year long. California is a margarita kinda place, right? Oh my! That colour is absolutely gorgeous :) I absolutely love this dessert idea and of course, blood oranges are so easy to find right now. Perfect Galentine's/Valentine's treat! Thank you Jennifer! I'll be sad when those blood oranges disappear from their spot at my market for sure!